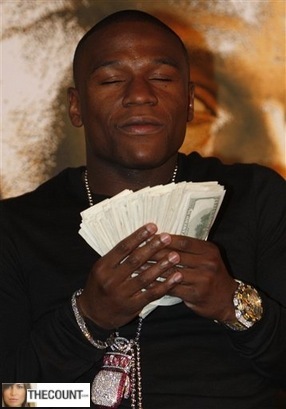 Floyd Mayweather JR. Threatens To Sell EX’s Belongings On eBay! Floyd Mayweather JR. may have bought his fiancée one of the world’s most expensive diamond rings, but that did not make the couple immune from reality as it seems they have now split. And it’s about to go in the mess zone with Mayweather threatening to sell of his ex’s crap on auction website, eBay! MTO is reporting that Mayweather had separated from his fiance, Chantel Jackson. According to Mayweather, Chantel was abusing the privileges (and the $$) of the being the CHAMP’S chick – by excessively using his private jet to fly to Los Angeles. The split seemed to be going along very SEAMLESSLY . . . until Chantel threw a party THIS WEEKEND, and flirted with a number of men at the event, including AKON. Floyd must feel SOME KIND OF WAY about her moving on with her life . . . because yesterday he announced that he’s going to be SELLING ALL HER ISH (which he undoubtedly bought her) on Ebay. Floyd SHOULD BE be preparing to fight, in what many are calling his biggest challenge to date, against Canelo Alvarez.